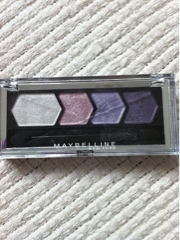 Today I used a purple palette from Maybelline silk glam in purple drama. 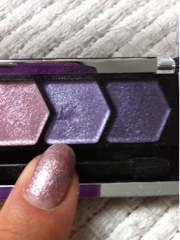 I firstly applied my MAC select cover up over my lids and under my eye, then applied my focus colour as my base colour all over. This cream shade is not bright white, its a soft shade with a hint of sparkle. 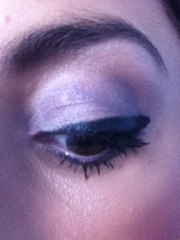 I then applied a soft pink to the centre and a purple to the crease, the edge and then on my lower lash line. 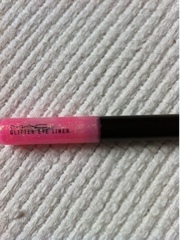 A large flick of Maxfactor Gel Liner and my MAC glitter liner on my lower lash line in pinky wink to add extra sparkle! 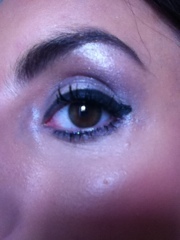 Lastly I added lashings of mascara and Benefit brow kit to complete the look. Great look. 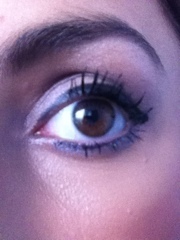 What eye brushes do you use?